These cabinets were created to solve a client's problem. They wanted to screen the kitchen from a great room in an open plan house, yet still allow light to pass between the two areas. This was achieved by having glass doors on both sides of the cabinet, as well as puck lighting internally to highlight the client's crystal collection. Inspired by the traditional glass designs of Frank Llloyd Wright and his Prairie School of Architecture, they are in fact, not quite "Wright". 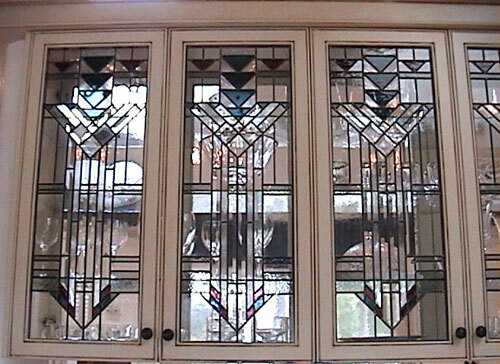 Rather than using the usual warm, earth-toned opaque glasses favoured by Wright, contemporary amethyst, steel blue and bevelled glass was used in these panels.